Here at Laken Inflatables we are always looking at ways to reach as many needs when it comes to a Childs Birthday Party so we have put together this very special package which is great for babies, toddlers and those with additional sensory needs. Our AMAZING sensory tunnel has been made specifically for us and benefits from the brightly coloured rainbow outside, then crawl inside through the multicoloured tassel curtain & enjoy the secret hideout den, lay back & enjoy the night sky which has been hand painted on the inside of the tunnel along with colour changing (remote-controlled LED lights) Multicoloured tassels & many other sensory features (6 sensory features in total). 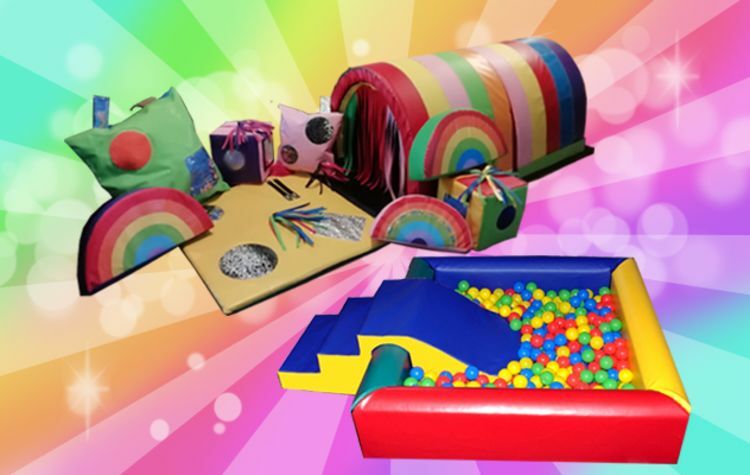 In addition to the sensory tunnel we have added 2 sensory pillows, 2 sensory cubes all with sensory features, Brightly coloured soft play rainbows one of which also benefits from an added sensory idem of glitter, and to top it off a bright yellow sensory mat and our Brightly Coloured Ball Pool with small Slide.